As lovers of the sea and the life it brings, our toe ring collection is mainly made up of sterling silver sea life toe rings with designs that revolve around the sea, and more often, beneath it. You should find our dolphin and turtle collection particularly impressive! Let's begin this sterling silver sea life toe ring collection with the most representative sea creature - fish! This lovely swimmer is small but its details are well thought out and distinct. Look how lively this starfish appears! The dark and bright silver contrast turned out great and this sterling silver starfish toe ring is a good option to wear to the beach or reminds you of it. Don't we all love crabs? You're happy to see this one, aren't you? A 5mm wide cuff ring of embossed dolphins in very small and fine detail is crafted with an antiqued finish background. 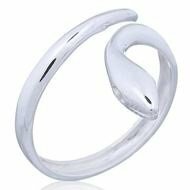 Arched dolphins are lined throughout this dolphin 925 sterling silver toe rings jewelry, nose to nose, tail to tail to suggest movement and activity. Photographing silver jewelry is a challenge and generally, we find gold jewelry easier to photograph. This is a photograph of the dolphin toe ring Dtoe 523 in gold. This is basically a wrap-around dolphin in the form of a toe ring. It is like having a silver dolphin wrapping itself around your toe. This attractive double dolphin sterling 925 silver toe ring is created with a detailed pair of dolphins moulded on a cuff band of sterling silver. In this double dolphin sterling silver toe ring, (6mm wide in front to 2mm behind) the background is textured to represent water in movement. Romantic dolphins... Turn the toe ring upside down and you'll see a heart shape formed by the dolphin couple. For fun, you can wear this couple dolphin sterling silver toe ring upside down to emphasize the heart shape. 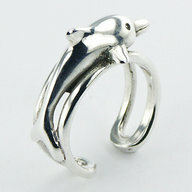 In this lovely toe ring, two dolphins rub against each other as they greet. This is an extra large toe ring. Although toe rings are meant to be free size, regular ones are often found to be too small. This XL toe ring is introduced for this reason. The distance between the tail and snout is one inch and the dolphin is 11mm wide. For an idea of the toe size it fits, it can be pushed and pulled to comfortably accommodate a finger size of 6 to 9. This toe ring is large in many aspects and is made with a high amount of silver. These are great if you'll like colors on your dolphins. The width of the toe ring band is about 5mm. 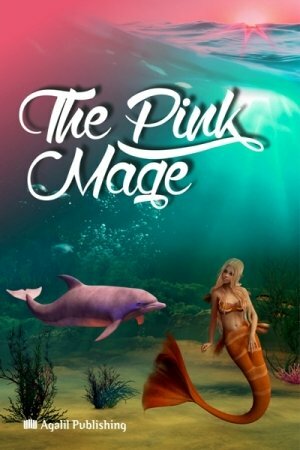 If you like your dolphin to sparkle, this model is a great option! 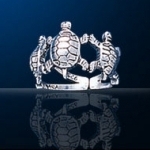 Endearing sea turtles encircle this open design 5mm wide 925 sterling silver sea turtle toe ring. Amidst a textured and etched background, the turtles and waves are embossed and raised. These extra efforts and crafting techniques are made use of, for the turtles to appear spirited and outstanding. 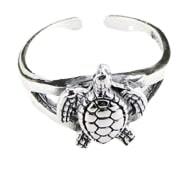 6 turtles are deeply etched into a smooth sterling silver toe ring band. 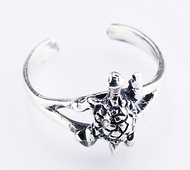 The little turtles are very cute and the contrast makes this sea turtle sterling silver toe ring very attractive. Tortoise lovers will be thrilled with this very detailed and elaborate tortoise sterling silver toe ring design. The 3 tortoises are of a good size with the middle one bigger than the other two. 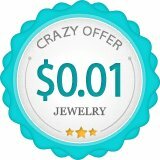 This piece of sterling silver tortoise jewelry is so impressive, it will look good as a pinky ring as well. As far as sterling silver Sea Turtle toe ring goes, they don't come more unique than this - the top of the turtle bears the art of Australian Aborigines! Thought you should know. People are going to ask when you wear this and you'll have some explaining to do.  Click on the photograph for a closer look at the design. A generous amount of silver is used for the toe ring. The sea turtle is of a good size and highly detailed, it will be obvious what you're wearing on your toe. This is really cute. A baby Sea Turtle breaking out of its shell. If you're more into tortoises that turtles, this is adorable. This snake toe ring is size adjustable as the band is not fused. Seas are great, and so are beaches. Here's a flip-flop toe ring with waves that is suitable for both. This wave design sterling silver toe ring jewelery is a 4mm wide piece, hand-carved all around with a wave motif. The raised repeating waves form a lively contrast to the darker background with an antiqued effect. A variation to wave design sterling silver toe ring Dtoe 225, with tighter and smaller waves and comes in a 4mm wide band as well. An artistic filigree design etched into a 5mm wide band creates this simple yet elegant sterling silver toe ring jewellry. The delicate design of this filigree toe ring showcases beautiful craftsmanship and delicate touches. Another intricate 5mm wide 925 sterling silver filigree toering jewelry. Delicate vines of filigree curl and twist in an elaborate design, creating an artistic piece of toe jewelry. Adjustable Irish Celtic knot weave design 925 sterling silver toe rings. An intricate basket-weave design set on a 5mm wide silver cuff band toe-ring adds a classic yet elegant touch to your toes.